tulip flowers in a close up view! 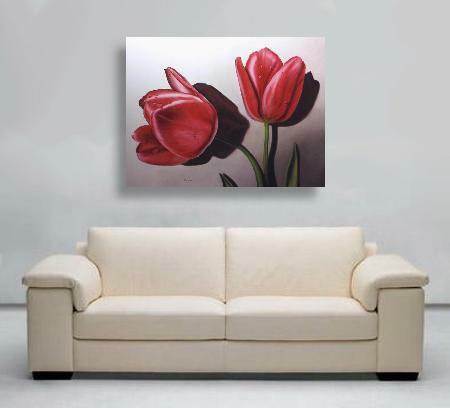 This pair of tulips will excite any room. 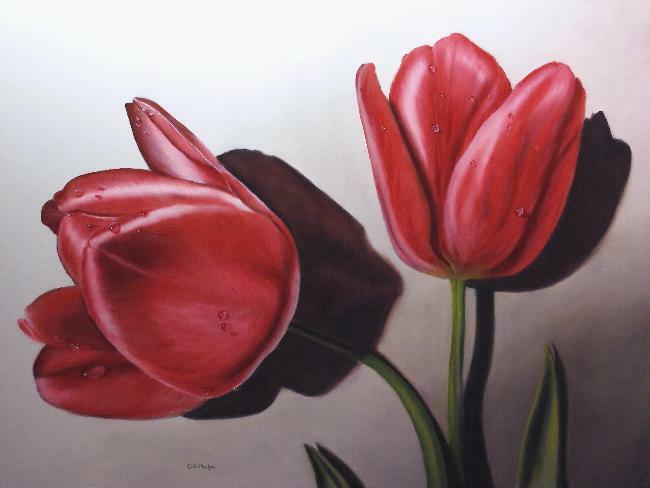 These red tulip flowers are depicted freshly cut and still wet with dew, lying on the table cloth and being made ready for the vase. This image is striking in it's 30" x 40" size. Click on any tulip pictures and get a larger view. Red is such a difficult color to paint, especially the nuances and shades which can quickly become just a big red splotch. In this piece however, the nuances in tone are very, very evident. There are at least 6 different red hues within the petals ranging from pinks to magenta! 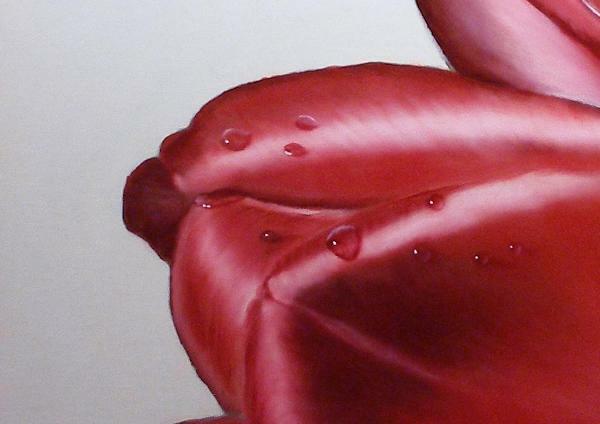 Also in this painting, the fine details of the blossom petal are evident. The dew gently caresses the sides as they fall away. And the array of reds simply cannot be duplicated on your computer monitor as well. I remember the day I set these up in my backyard. Because of all these subtle shades of red within this flower, my flood lights within the studio just were not giving them justice. So, outside with my table, drape, squirt bottle to simulate dew drops, and camera. Sunlight was a great asset. But my camera still couldn't capture these reds. It did it's best, but a short color study was my savior. So, my lesson learned, certain colors, (like red) just can't be duplicated the way my eye sight can discern them. 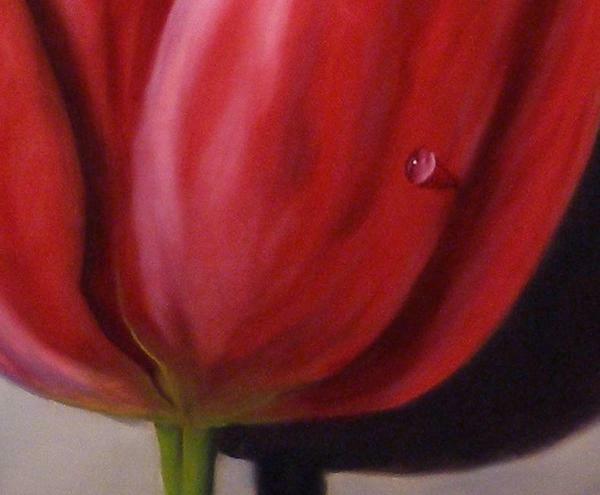 And when a predominantly red flower is going to be painted, I do a color study. The is one of the world's most easily recognized and loved flowers. They are not too elegant, too romantic, too big, too small, or too bright; the tulip is always just right. Tulips express genuine coziness and comfort in all of the right ways. More info on the Red Tulip, a bit of history. The tulip originated over ten decades ago in Persia and Turkey, where it played a significant role in the art and culture of the time. Most likely commenting on the Turkish tradition of wearing tulips in one’s turban, Europeans mistakenly gave tulips their name, which comes from the Persian word meaning turban. As Europeans began taking to tulips, the flower’s popularity spread quickly, particularly in the Netherlands where a phenomenon dubbed tulip mania set in at one point during the 17th century. Tulips became so highly-prized that prices were sent soaring and markets crashing. Tulips are now grown throughout the world, but people still identify cultivated varieties as "Dutch tulips." The meaning of tulips is generally perfect love. Like many flowers, different colors of tulips also often carry their own significance. 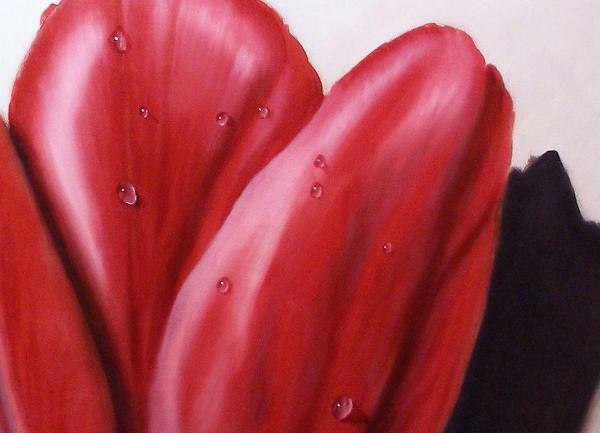 Red tulips are most strongly associated with true love. Prints coming soon! Signup for my new works newsletter. 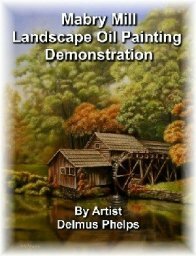 The new works newsletter just sends out a quick email when new work is added to my personal art website, delmusphelps.com! Come on and join the fun.